The Rayfont Nanpu Hotel & Apartment is located in Shanghai making it one of the best hotels to stay at while in town. The Rayfont Nanpu Hotel & Apartment boasts a convenient location with modern amenities in every guestroom and superb service. Each guestroom features amenities such as desk, bathrobes, daily newspaper. 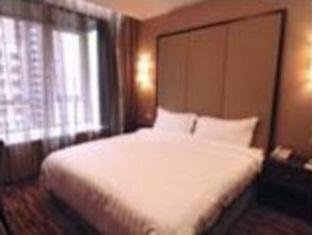 Services and amenities available for guests at this Shanghai accommodation consist of coffee shop, elevator, bar/pub. For guests to unwind, the hotel offers a variety of facilities and services including gym. Being one of the good quality hotels in Shanghai, guests staying at this hotel will find its convenient location and tranquil atmosphere pleasurable. To proceed with your reservation at the Rayfont Nanpu Hotel & Apartment via our secure online booking form, please enter your period of stay.